Enrich your cultural experience within this European infused structure. 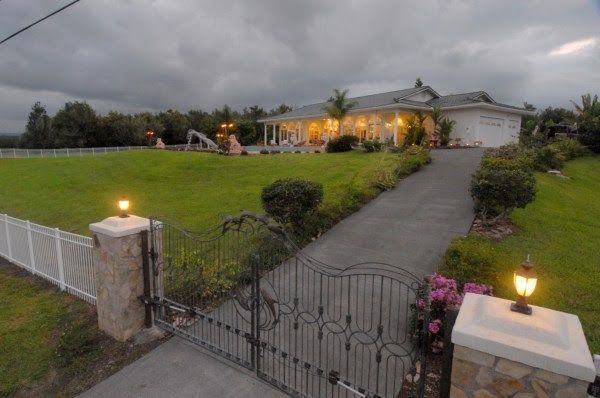 A true gem in the heart of Hilo that overlooks the bay by day, and the lighted town at night. Cater your next gathering with the luxuries of poolside cookouts while pampering your royal ambitions with original artwork. ALOHA!Hilo house description The ocean view estate in Hilo is a gorgeous European-style home located in the exclusive area of upper Wainaku in Hilo. This stunning home has spectacular panoramic views of the ocean and Hilo town. Watch the magnificent sunrises in the morning and star-filled skies at night. The evening city lights of Hilo make are breathtaking. This home has all the luxuries of amenities of an estate. Swimming pool, gourmet kitchen and appliances, high ceilings, lanai with ocean views the privacy of a gated estate. The details and accents of the home from mango wood floors to the extra high ceilings make for a grand and one-of-a-kind property in Hilo. This home is conveniently located in Hilo minutes from downtown. 4 bedrooms | 3 bathrooms The master bedroom has french doors opening into the lanai, jacuzzi tub with separate shower and fireplace with King size bed. The other 3 bedrooms consist of 2 queen beds and 2 twin beds with 2 bathrooms. The property has garage parking for 3 cars and exterior parking for 4+ cars. The home is located about 18 minutes from Hilo International airport, 5 minutes to downtown Hilo, 20 minutes to Nani Mau gardens, 15 minutes to Akaka falls, 5 minutes to Honilii surf beach and other main attractions.